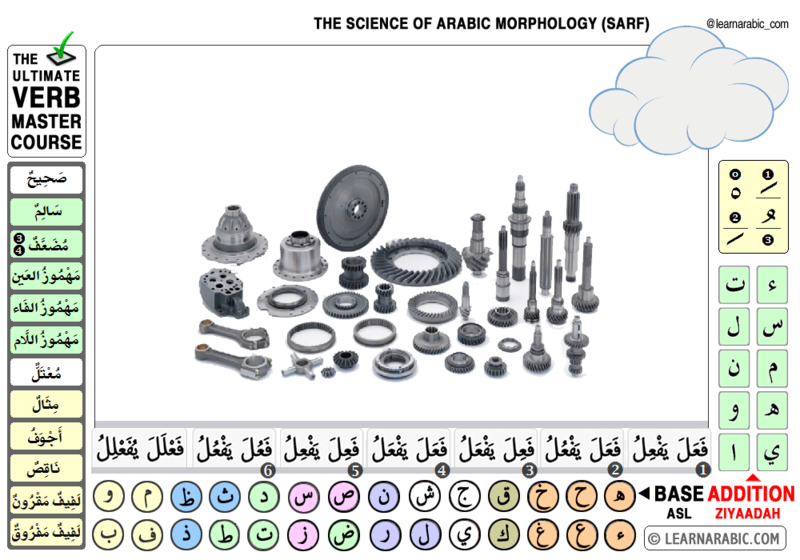 Mastering the Arabic verb system is the key to mastering the Arabic language. The great scholar of Arabic, Ibn Mālik, said: "Whoever masters the tasrīf (structural modifications) of the verb will acquire and encompass all the paths and routes of the language." The study of the science of sarf (morphology) should precede study of grammar. Unfortunately, most curriculums today do not offer a detailed, comprehensive study of sarf and focus mostly on grammar. As a result, the overwhelming majority of Arabic learners will inevitably come across numerous stumbling blocks and barriers created by lack of knowledge and proficiency in this field. No matter how one tries, these blocks and barriers will not disappear except with proficiency in the field of sarf. Most often, this fact is not recognised by Arabic learners who struggle for years, if not decades, to progress beyond a certain level. At LearnArabic.Com we have taken this very complex and difficult subject and made it very easy and systematic to learn using a teaching style that makes the content easily comprehendable and memorable. "Forms, Structures and Meanings" is the third part in our series and builds on top of the knowledge gained in the first two parts. Following the dissection of the verb pyramid, we move on to structures and meanings in this course. The course follows the same style and pattern as previous courses. You receive detailed, insightful instruction, along with important connections to make sure you attain full comprehension and mastery of the verb system. It will develop in your mind a very clear, strong, vivid imagination and conceptualisation of the building blocks of the Arabic verb system thereby laying the foundations for ultimate verb mastery (inshāʾAllāh). The course will aid you in becoming competent enough to appreciate the beauty and superiority of Arabic over all other languages and to experience the balāghah (eloquence) and iʿjāz (inimitability, miraculousness) of the Qurʾān. The course is exciting, amazing and magnetic. Followed the lessons with a smile and with overwhelming gratitude to Allaah for blessing me with such a beneficial course. It is like peeling off the layers of an onion only to find a different and beautiful shade EVERY TIME with lots of embellishments. ...the way the brother has explained is simply fantastic. The new Mastering Verbs course attracted me to the site for the reason that for over 40 years I have had difficulty with this important topic. Through this, I was drawn into other parts of the site and have found the tools for memorising words and so on very helpful. I am currently studying with an Egyptian Teacher in reading and comprehending the Quran and I find the course very enlightening, however we do not go into Sarf and Nahw in much detail and these "Learn Arabic" courses are helping me to cover these areas. I am certainly no scholar and book learning has always been difficult for me. I find the interactive methods used here suits me. I have learnt a tremendous amount thus far about the subject of Sarf. The simple explanation and overall presentation is so impressive. Not only are your lessons filled with information, but it's structured in a beautiful step by step manner with just the right amount of repetition needed for learners to grasp new and complicated concepts. The pace at which introduction of new information happens is fantastic. This course is for intermediate level learners who have already taken the first course in the series. However, the course is taught in a way that makes it suitable even for beginners who have basic knowledge of Arabic. The course will be available on 27th May 2018. Related search terms: Learn Arabic, Arabic Verbs.